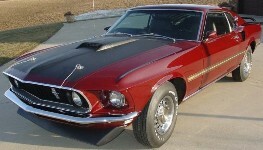 1969 The 1969 Mustang Mach 1 (starting at $733 over the base V8 fastback or "SportsRoof" body) came standard with a matte black hood, hood scoop (only functional with the SCJ Ram Air Drag Pack engine), exposed NASCAR-style hood lock pins (could be deleted), a spoiler (at extra cost), reflective side and rear stripes, color-keyed sport mirrors, special handling suspension, and chrome exhaust tips. In the interior the Mach 1 came standard with high-back seats, black carpets, a Rim-Blow steering wheel, center console, clock, sound-deadening insulation, and teakwood grained trim on the doors/dash/console. 1970 The 1970 Mustang Mach 1 came only on the fastback body style. Factory options included: 351ci 4-barrel engine, 3-speed manual transmission, Ford 9 inch 3.00 standard axle ratio, black hood stripe, F70x14 belted tires, power steering, AM radio, tinted glass, front bumper guards, and tachometer. 1971 The 1971 Mustang Mach 1 came only on the fastback body style. 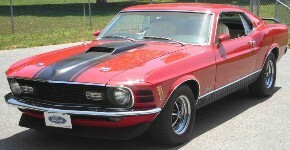 The 1971 Mach 1 came with color keyed sport mirrors, spoiler, rear bumper, hood, and front fender; sport fog lamps integrated into the grille; sport suspension, wheels, and trim rings; black honeycomb rear panel; black or argent silver rocker panel paint; decklid, bodyside, and hood stripes; the 302ci V8 engine; and optional NASA styled vented hood. The Mach 1 sports interior has knitted vinyl seats, deluxe two spoke steering wheel, molded door panels, black dash panel with wood grained center instruments group panel, electric clock, rear ash trays, and color matched front rubber floor mats sewn to the carpet. 1972 The 1972 Mustang Mach 1 was a sport special model consisting of a NASA-style scoop hood; argent silver or black lower body finish; color keyed front bumper, rear fender moldings, and sport mirrors; black honeycomb grille with integrated fog lamps; sport hubcaps with trim rings; a 302ci, 2-barrel, V8 engine; and a sport interior with high back bucket seats, electric clock, triple instrument pod, black and wood grain dash trim, and deluxe carpet and door panels. 1973 1973 was the last year for the classic Mustang Mach 1 which was a sport special model consisting of a NASA-style scoop hood; argent silver or black lower body finish; color keyed front bumper, rear fender moldings, and sport mirrors; black grille with integrated fog lamps; sport wheels; and a sport interior with high back bucket seats, electric clock, triple instrument pod, black and wood grain dash trim, and deluxe carpet and door panels. 1974 The 1974 Mustang Mach 1 offered styled steel wheels with chrome trim rings, remote control racing mirrors, and unique paint tape treatment on the newly designed hatchback body style. 1975 The 1975 Mustang Mach 1 came with a larger engine; the Rallye Package which included Tracktion-Lok differential, 195/70 BWL tires; an extra cooling package, exhaust with bright tips, and digital clock; and the competition suspension system which consisted of heavy-duty front and rear springs, rear stabilizer bar, and adjustable shocks; color keyed remote adjustable side mirrors, leather wrapped steering wheels, and styled steel wheels with trim rings. The 1975 Mach1 came only in the hatchback body style. 1976 The 1976 Mustang Mach 1 included an engine, wheels, and interior upgrade as well as all the Mach 1 badging. A detailed list of the standard 1976 Mach 1 offerings include: steel-belted radial tires; tachometer, ampmeter, and temperature gauges; contoured bucket seats, color-keyed cut pile carpeting, fold down rear seat, styled steel wheels with trim rings, and dual remote control mirrors. 1977 The 1977 Mustang Mach 1 included engine and suspension upgrades, a black lower side, black back panel, bright lower moldings, Mach 1 insignia, dual sport mirrors, and optional forged aluminum wheels. 1978 The 1978 Mustang Mach 1 included the 104hp 170ci (2.8L) 2-barrel 6-cylinder engine, styled wheels with raised white lettered tires, front and back black rear bumpers, lower black body side paint, brushed aluminum instrument dash panel, and full instruments package. 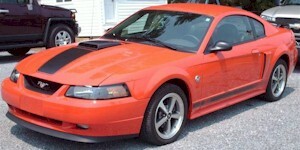 2003 2003 saw the return of the Mach-1 special model Mustang. A quantity of 9,652 Mach-1 Mustang coupes were produced in 2003. It had a special 4.6L engine which used heads from the SVT and a DOHC cam from Ford's 5.4L Triton V8. This boosted horsepower from the stock 4.6L V8 in the GT from 260hp to 305hp and torque from 302ft-lb to 320ft-lb. 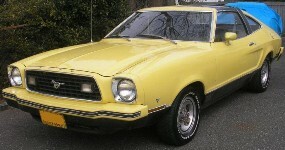 The Mach-1 also had a distinct stripe and trim package. 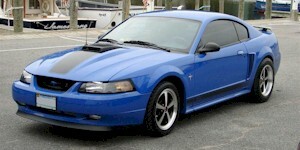 Azure Blue was exclusive exclusive exterior color for the 2003 Mach 1 although it also came in Oxford White, Zinc Yellow, Dark Shadow Gray, Black, and Torch Red. 2004 The 2004 Mach 1 standard features included: an exclusive 305 horsepower DOHC 4.6L V8 engine, dual exhaust, special suspension tuning and lower ride height, 17-inch aluminum wheels, a shaker hood scoop, and black over the top stripes and rocker stripes. The Mach-1 could be ordered in Azure Blue, a Mach-1 only paint color; or Competition Orange, Oxford White, Screaming Yellow, Dark Shadow Gray, Black, and Torch Red.